When many of us think about nature and wildlife, our thoughts drift to faraway places. However, Oakland County remains surprisingly rich with wildlife. Even with increased urbanization and a loss of biodiversity accelerated by human actions, wild animals are abundant in parks, trails, greenways, and even have the freedom to wander our cities, villages, and townships. One might say their wild spirit leads them, but in reality, it is their endless search for prey. Despite the fact that we live in the midst of a vast array of wildlife, it’s not easy to get a true glimpse into their daily lives. By using hidden cameras, we can observe wildlife in their natural habitat and view a true representation of their day and nighttime behaviors. Three species are standouts when it comes to being captured by motion-activated camera traps: the red fox, the white-tailed deer and the eastern coyote. Their stealthy night moves, caught on camera, give us a glimpse as they are, not as our minds imagine them. Irrational fear mongering on the wild ways of the coyote can reach a feverish pitch. They are often fueled by media reports that lack facts and overflow with sensationalism. The fact of the matter is: the coyote’s diet consists mostly of mice, voles and rabbits. Not to mention, their presence adds to healthy ecosystems and helps keep ‘the wild’ in wildlife. Night images capture coyotes as curious, intelligent and alert creatures. Deer are the largest species of wildlife found in Oakland County and their numbers soar due to human manipulation of habitat and land use practice. Interestingly, it is deer, not coyotes that pose clear and present dangers to humans as facts make clear. The Michigan Deer Crash Coalition states, “There is an average of 134 deer/vehicle crashes each day. Although reported deer/vehicle crashes in Michigan increased in 2013 to 49,205, from the 48,918 crashes reported in 2012, many crashes also go unreported, so actual crash numbers are much higher. In 2013, Oakland County had the most deer/vehicle crashes with 1,801 crashes.” SEMCOG adds, “There were 5,667 vehicle-deer crashes in Southeast Michigan in 2013, (up from 5,206 in 2012 and 5,443 in 2011). 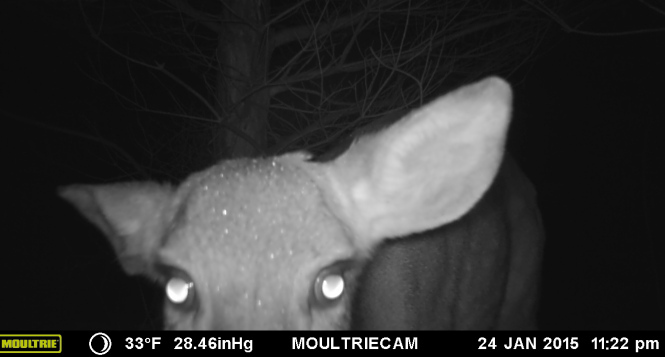 In 2013, there were two fatalities in Southeast Michigan involving deer compared to 12 fatalities in the state.” Night images neither show deer as a hunter’s prey or as a danger to autos. They are simply deer. The red fox deserves its near legendary reputation for intelligence and cunning. They are far more common than many realize. They are solitary hunters feeding on mice, voles, rabbits, birds, and whatever they may find in winter (including bird seed, garbage and pet food). And yes, they do occasionally head for a rural chicken coop. 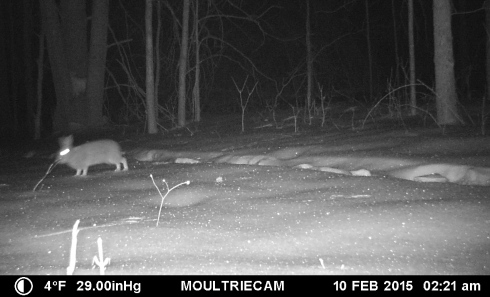 The hidden camera catches them in their most common hunting practice: night moves – mousing for a meal. Tracking and the art of observation are at their finest when snow covers the ground, but it is the hidden wildlife camera that really helps us see the world of wildlife with a more knowing and appreciative eye. Visit DestinationOakland for details on the trails of all 13 Oakland County Parks.